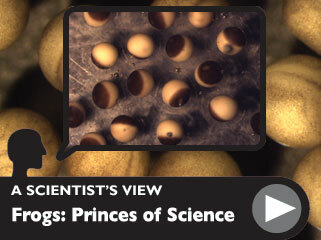 From fertilization to pregnancy tests, watch and listen as Xenopus researcher Dr. Thierry Brassac shows how these creatures, with their enormous egg cells and their acts of metamorphosis, have been helping scientists for centuries. Frogs have no small claim to fame in biology. They’ve provided us with the first reliable pregnancy tests, donned rubber pants in the name of research, and appeared in many high school biology dissections. Frogs have helped us learn about the connection between nerves and muscles, taught us how to do skin grafts, and have contributed to our understanding of fundamental biological processes such as fertilization, cell division, and development. What’s so special about frogs? Frogs are ancient creatures, and as such, have many attributes common to all vertebrates. They also possess a host of qualities that make them a princely (or princessly) model for research. The eggs of the female African clawed frog Xenopus laevis are quite large, so researchers can not only see them clearly, but can also easily inject substances like drugs or DNA and observe the effects. Embryonic Xenopus cells go through divisions very quickly, and they can be stopped at specific points in the division cycle, allowing researchers to extract clusters of cells at the same stage of division. Xenopus tadpoles are transparent, so scientists can watch what’s happening inside them as they metamorphose into adult frogs, which can then live in the lab for up to 20 years. Prolific egg layers, they provide researchers with a continual supply of material. 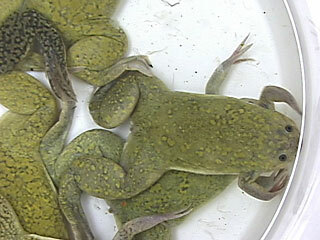 A female Xenopus laevis can lay hundreds of eggs at a time and can live up to 20 years in a research laboratory. They were originally brought to the U.S. from South Africa in the 1930s. The egg-laying talent of the Xenopus female was its ticket into the research laboratory—via the family planning clinic. In the 1930s, scientists discovered that a hormone present in the urine of pregnant women could make the female Xenopus produce thousands of eggs. Xenopus became the basis for a 24-hour pregnancy test, and many hospitals kept populations of them on hand. Now, of course, we can detect pregnancy without amphibians, and researchers use just the pregnancy hormone, rather than urine, to keep frogs producing eggs all year.